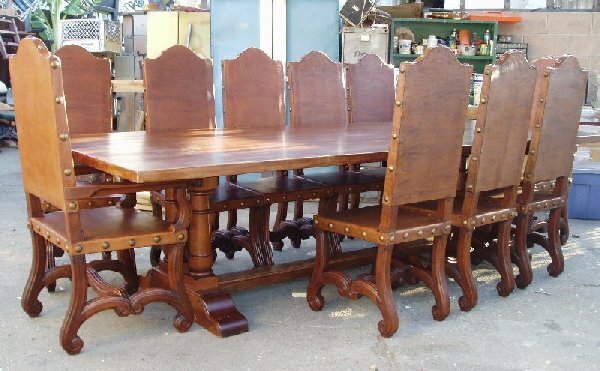 Custom Tuscan style furniture, Custom Tuscan Dining Room, Custom Tuscany Furniture, Custom Italianate Furniture, Custom Spanish Revival Furniture, Custom Spanish Colonial Furniture, Tuscan Decor, Tuscan Furniture, Old World Tuscan Furniture, Renaissance Furniture, Custom Rustic Furniture, Custom Italian Villa Furniture, Custom Mediterranean Furniture, Custom Gothic Furniture, Custom Medieval Furniture, Monterey, Custom Santa Barbara Style furniture, Classic Western, and Cowboy chic designs. Specializing in designs featured in books like Casa California: Spanish-Style Houses from Santa Barbara to San Clemente, California Romantica: Spanish Colonial and Mission-style Houses, California Colonial, Monterey: Furnishings of California's Spanish Revival, Red Tile Style, Hacienda courtyards, Spanish Houses: rustic Mediterranean Style, Casa Mexicana Style, Revival Antiques, Montecito Collection, furniture style for celebrities and wealthy business people who own Montecito homes and large estates.. 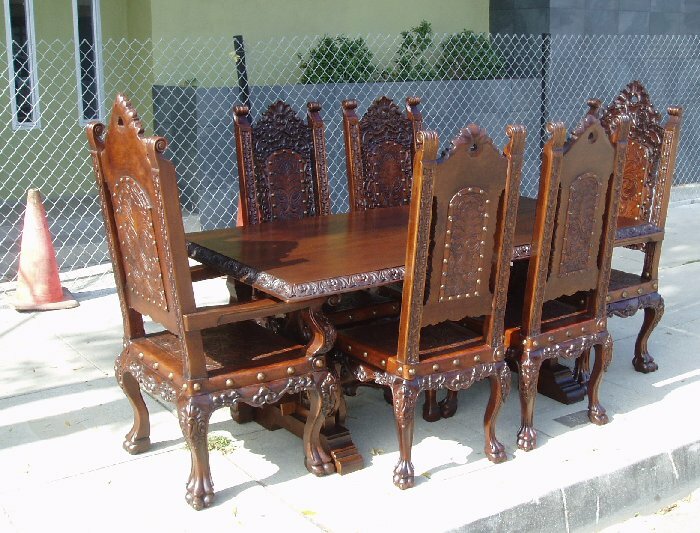 Please also visit our website for Renaissance Furniture. 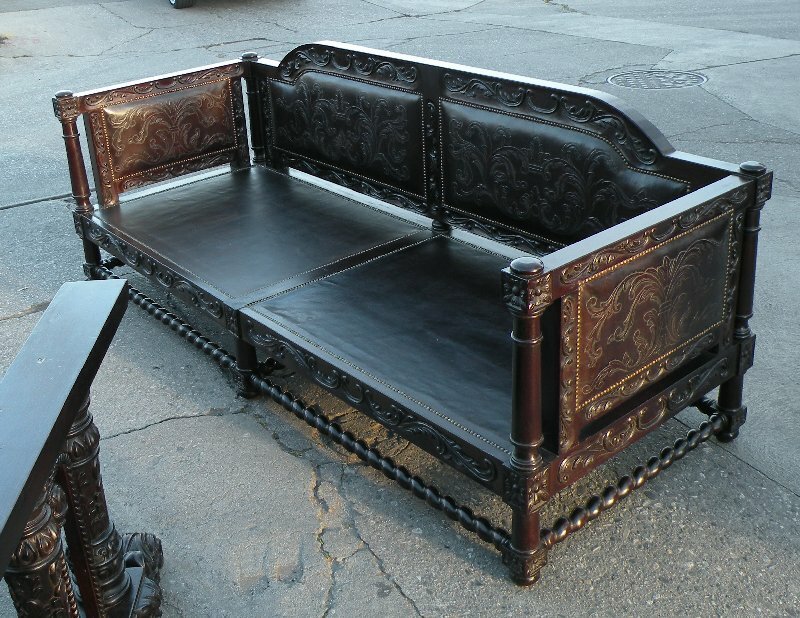 R Furniture.com Custom designs available. Click here for pricing and more info. 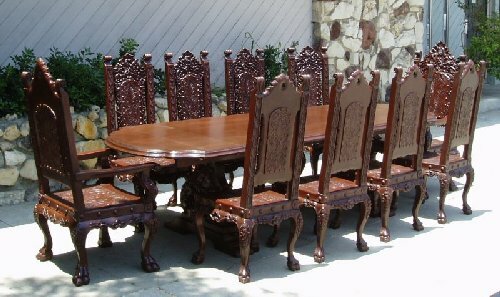 Isabellina Dining Table 120"L x 42"W with 10 chairs in Chestnut color and leaves. Tuscan Dining Room. 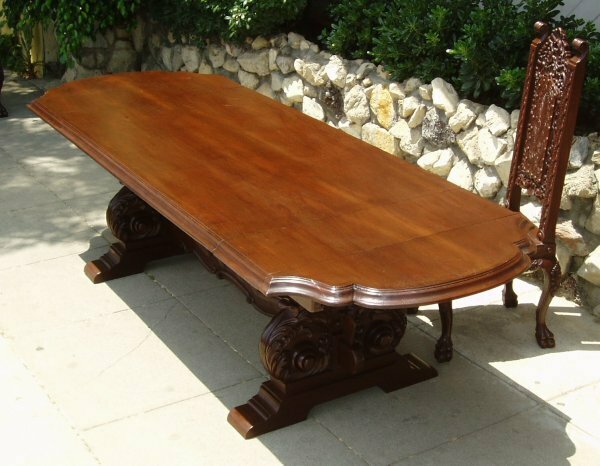 Isabellina Custom Table 120" Tuscan Dining Table. 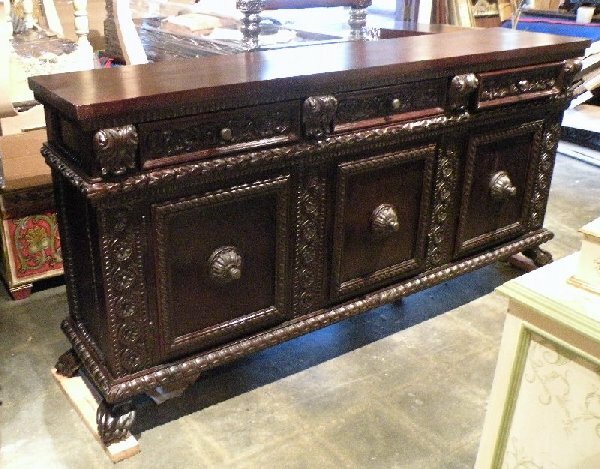 R Furniture and Architectural offer furniture, architectural elements and interior design in Los Angeles and Southern California.. Also serving Albany, N.Y., Albuquerque furniture, N.M., Altamonte Springs furniture, Amelia Island furniture store, Best Atlanta furniture store, Aurora, best Austin furniture, Texas, Boca Raton furniture, Baltimore, Bel Air, Beverly Hills furniture style, Birmingham Luxury homes, Best Bonita Springs furniture, Luxury Boston furniture, Bozeman furniture, Buffalo, Calabasas furniture style, Carmel furniture style, Charlotte furniture, Chicago, Cincinnati, Cleveland, Colorado furniture style, Costa Mesa furniture, Columbus, Ohio; Dallas, Dayton, Ohio; Denver, Des Moines; Detroit, El Paso, Texas; Fort Myers furniture, Fresno, Calif., Glendale Spanish Revival Homes, Grand Rapids, Mich., Greensboro, N.C., Harrisburg, Pa.; Hartford, Luxury Hidden Hills furniture style, Honolulu, Hollywood Celebrity luxury furniture style, Houston, Indianapolis, Jacksonville, Fla.; Kansas City, Mo. 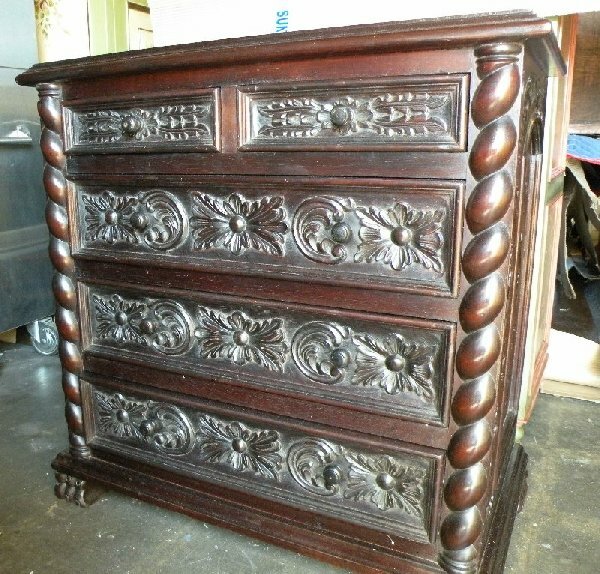 ; Knoxville, Tenn.; Laguna Niguel furniture, Las Cruces furniture, Las Vegas, Best Los Altos furniture design, best Los Angeles furniture, Los Feliz Spanish Revival Furniture style, Los Gatos furniture, Best Orange County furniture,; Riverside, Calif.; Louisville furniture, Ky.; Malibu furniture style, Memphis, Tenn.; Best Miami furniture style; Best Mill Valley furniture design, Milwaukee, Minneapolis furniture, Montecito furniture style, Napa Valley furniture style, Naples furniture design, Nashville; New Orleans furniture, Luxury New York furniture, Northern New Jersey, Southern Connecticut, Norfolk, Va., Oklahoma City; Omaha, Neb. 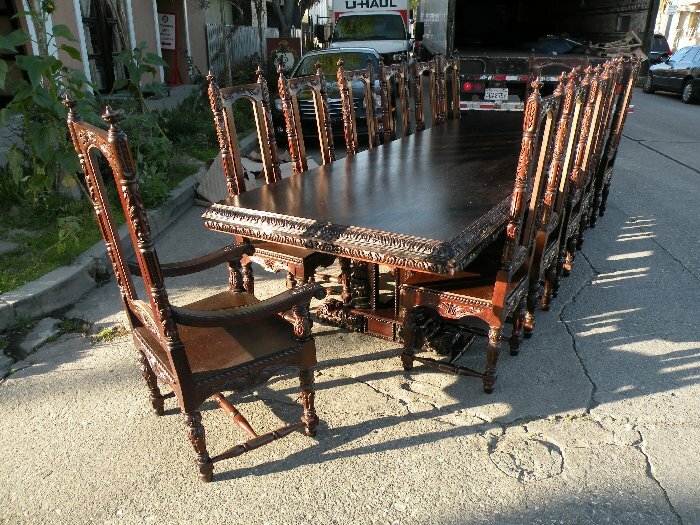 ; Best Orlando furniture; Pasadena Spanish Revival Homes, Philadelphia; Phoenix home and garden furniture style; Pittsburgh; Portland, Ore.; Providence, R.I.; Raleigh, N.C.; Richmond, Va.; Rochester, N.Y.; Sacramento, Salt Lake City; San Antonio; San Clemente, San Diego; San Francisco; San Rafael furniture store, San Simeon furniture, San Jose, Santa Barbara furniture style, Santa Monica furniture, Santa Fe furniture, Santa Ynez furniture, best Sarasota furniture design, Sausalito furniture, Luxury Scottsdale living, Solano Beach furniture store, Scranton, Pa.; Seattle, St. Louis; Syracuse, N.Y.; Best Tampa furniture; Toledo;Toronto furniture, Tucson; Tulsa, Okla.; Washington, D.C.; West Hollywood furniture store, Melrose furniture, Celebrity furniture, West Palm Beach furniture, and Worcester furniture, Massachusetts, Spanish furniture, Old World Tuscan Furniture style, Made in Peru, Peruvian furniture, hand painted furniture.